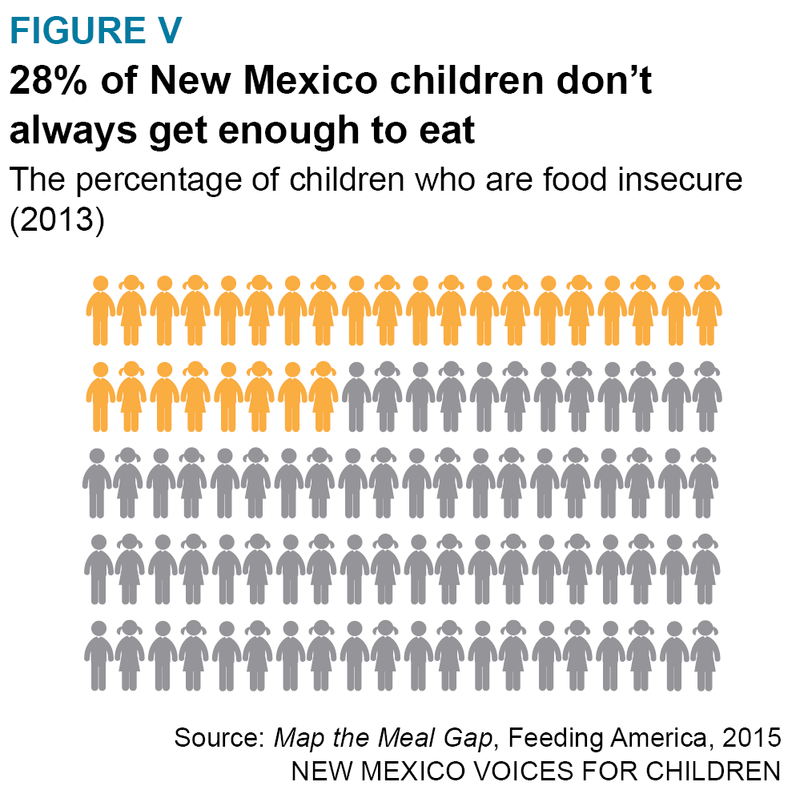 New Mexico is a poor state with high rates of food insecurity and with too many adults and children suffering from nutrition-related chronic conditions, including obesity and diabetes. Programs that incentivize consumption of locally grown, healthy, fresh produce to food-insecure individuals offer both health benefits to low-income communities as well as economic benefits to local farmers. One example of a healthy food incentive program is Double Up Food Bucks (DUFB), which allows SNAP (Supplemental Nutrition Assistance Program) recipients to double their purchases of fresh, locally grown produce when they shop at participating farmers’ markets. This helps qualifying households access more food at no extra cost and eat more locally grown, fresh fruits and vegetables while creating demand for such produce and circulating more money in the local economy. Programs like SNAP DUFB—that generate a win-win for vulnerable New Mexicans as well as local farmers—should continue to be supported and be expanded throughout New Mexico. In New Mexico, 21 percent of the total population, and 30 percent of our children live at or below the federal poverty level—$19,790 for a family of three (see Figure I). 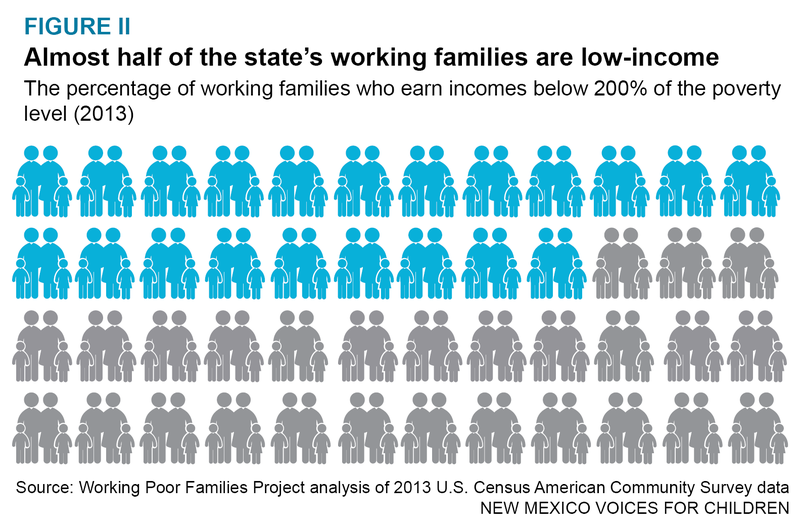 This places New Mexico second highest in overall poverty and highest in child poverty nationwide.1 Many New Mexico families are working hard despite the slow statewide economic recovery but 42 percent of our working families are low-income, meaning they earn less than 200 percent of the poverty level2 (see Figure II). 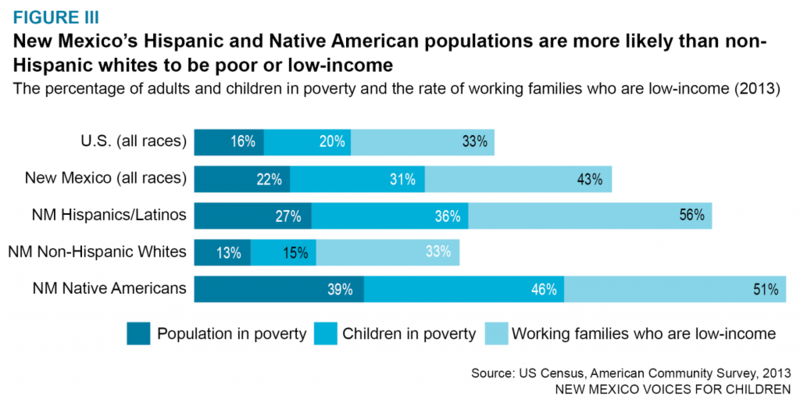 Racial and ethnic minorities are more likely than whites to live in poverty or earn low incomes (see Figure III). Racial and ethnic minorities in New Mexico, who are more likely than non-Hispanic whites to be poor or low-income, are also more likely to suffer from a variety of nutrition-related chronic health conditions (see Figure VI). Economic and health statistics showcase the need for increased funding for programs like SNAP DUFB that help low-income individuals have access to healthier foods, particularly fresh produce. In 2014, SNAP benefits helped partially cover food expenses for 431,000 very low-income New Mexicans (or 21 percent of the state’s population compared with 15 percent nationwide), with an average monthly benefit per person in New Mexico of $121.13 An estimated 88 percent of New Mexico SNAP households are poor (below 100 percent of the poverty line) and 45 percent are in deep poverty (below 50 percent of the poverty line). 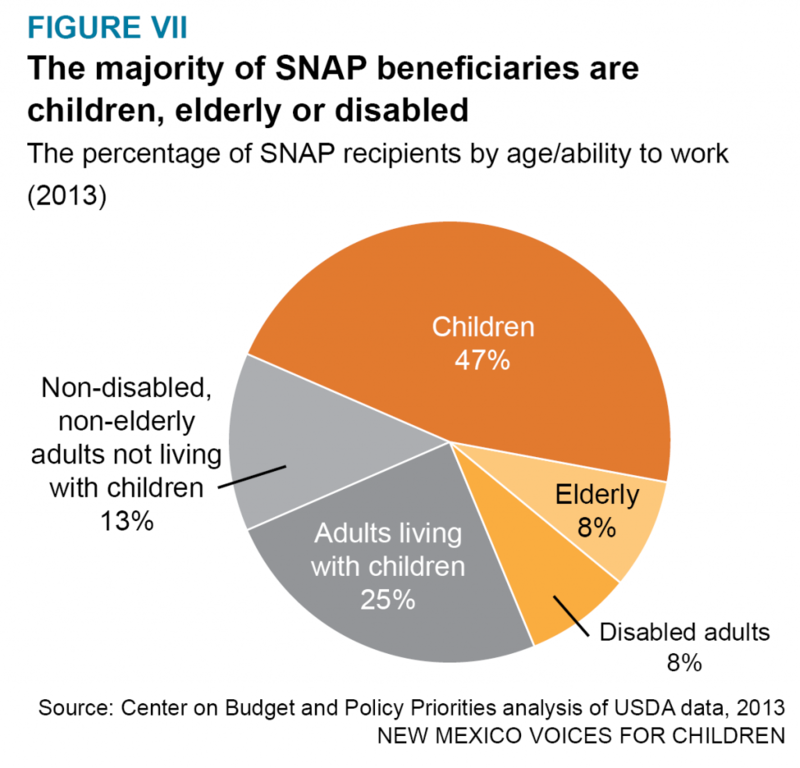 Additionally, the majority of SNAP beneficiaries (63 percent) in the state are children, or elderly or disabled adults (see Figure VII)—in other words, people with high nutrition needs.14 Unfortunately, the state is considering reinstating work rules that go beyond the requirements mandated by the federal government. These new rules would require individuals between 16 and 59 years of age, including parents with children older than 12, to work in order to access SNAP benefits. Those unable to find employment would be required to participate in many hours of volunteering or job training just to get the nutrition assistance. SNAP benefits not only improve food security but also directly added $630 million to the New Mexico economy in 2014.18 The economic multiplier is strong: The USDA estimates that every $5 spent in SNAP benefits generate $9 in local economic activity.19 With the SNAP DUFB program, more SNAP beneficiaries shop at farmers’ markets for healthy produce and more of the economic stimulus benefits local farmers and other New Mexico food producers. The New Mexico Farmers’ Marketing Association reports that 2015 sales significantly increased at most farmers’ markets that offered the program.20 SNAP sales at farmers’ markets went from $128,000 in 2014, when the DUFB program was locally funded in a handful of farmers’ markets, to more than $350,000 in 2015, when a combination of federal and state funds spurred the expansion of the DUFB program to 34 farmers’ markets and two farm stands in 20 counties across the state. This 175 percent increase in SNAP sales was welcomed by local farmers, many of whom say they plan to expand farming operations due to increased demand. 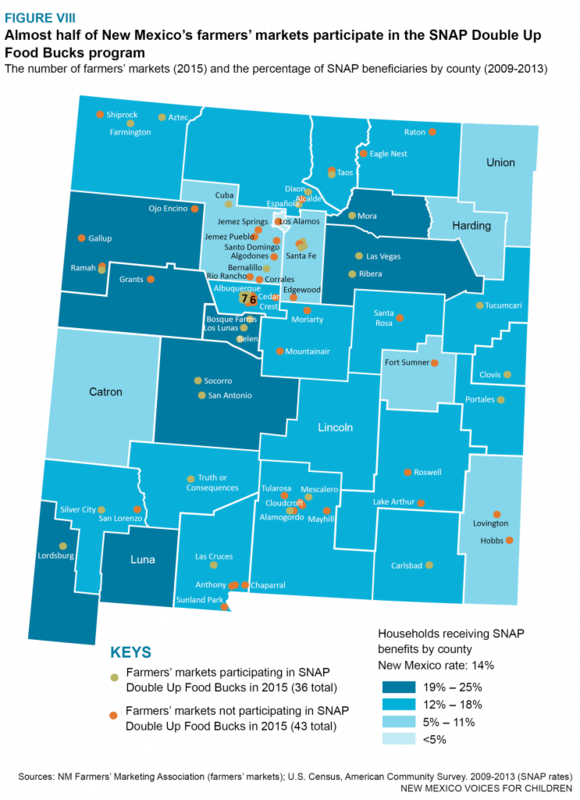 Counties with high food insecurity or SNAP participation rates that received large boosts in SNAP sales in 2015 through the DUFB program included Socorro, San Miguel, San Juan, Sierra, Rio Arriba, and Taos. The New Mexico Farmers’ Marketing Association is currently compiling survey data for the New Mexico DUFB program but evaluations of similar SNAP voucher and coupon programs at farmers’ markets across the U.S. have shown that SNAP transactions usually double and can even quadruple.21 In surveys done in other states, 78 percent of vendors shared that they had more repeat customers because of the program and managers of farmers’ markets reported that DUFB programs brought in new and more diverse customers.22 Looking at SNAP recipient feedback, more than 75 percent shared that DUFB was a strong incentive to shop at farmers’ markets and that they increased their purchase of fruits and vegetables as a result.23 Almost half of New Mexico’s farmers’ markets are already participating in the DUFB program (see Figure VIII) but additional funding, support, and outreach could make this program truly statewide. Support and expand SNAP DUFB. New Mexico’s farmers’ markets currently generate around $9 million in annual sales, according to the New Mexico Farmers’ Marketing Association. Those participating in DUFB in 2015 earned more than $350,000 in combined SNAP and SNAP DUFB sales. By 2016, more than half of all farmers’ markets will be participating in the DUFB program. Expanding the program to more farmers’ markets (including those in food insecure counties like Torrance, Lea and Chaves), to farm stands and co-op grocers will help increase access to healthy, nutritious foods for food-insecure New Mexicans while increasing demand for locally grown produce. Since SNAP DUFB state funding will likely leverage matching federal USDA funds, future recurring state funds should bring an additional $2 million in federal funds into the state during the next four years. Support a variation of the Fruit and Vegetable Prescription (FVRx) program using SNAP DUFB funding. In FVRx programs, enrolled patients with nutrition-related illnesses receive nutritional counseling as well as “prescriptions” for no-cost fresh fruits and vegetables redeemable at participating farmers’ markets. A new pilot program created by the New Mexico Farmers’ Marketing Association called SNAP Rx will pair such a program at three federally qualified health clinics in Northern New Mexico with the existing funding and infrastructure of SNAP DUFB. This promising and innovative program should help foster partnerships between health care providers and low-income individuals dealing with diet-related illnesses while improving health outcomes of at-risk populations and further increasing the demand for locally grown fresh produce. Upon successful pilot implementation, the SNAP Rx program should be expanded across the state. Increase funding for the New Mexico Grown Fresh Fruits and Vegetables for Schools Meals program. 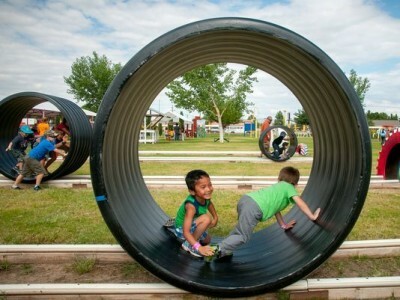 In 2015, with $364,300 of recurring state funding from the Legislature, more than 30 farms looking to expand their businesses participated in this program to provide locally grown fresh produce to as many as 218 School Food Authorities and school districts across the state, according to Farm to Table NM. For many food-insecure children, their school meals end up being their main meals of the day and providing nutritious foods that include locally grown fresh produce help improve children’s health while creating demand for locally grown produce. This funding also helps schools align with new federal school nutrition rules that now require twice as many servings of fresh fruits and vegetables in school meals. Optimize and streamline SNAP enrollment. The state should take full advantage of federal SNAP offerings including: drawing down all available SNAP outreach dollars for increasing SNAP participation; continuing the federal exemptions from work requirements; eliminating excessive and administratively burdensome verification requirements; and implementing “express-lane” enrollment to link SNAP, Medicaid, and child care assistance. As mentioned earlier in the brief, every $5 spent in SNAP benefits generate $9 in local economic activity. 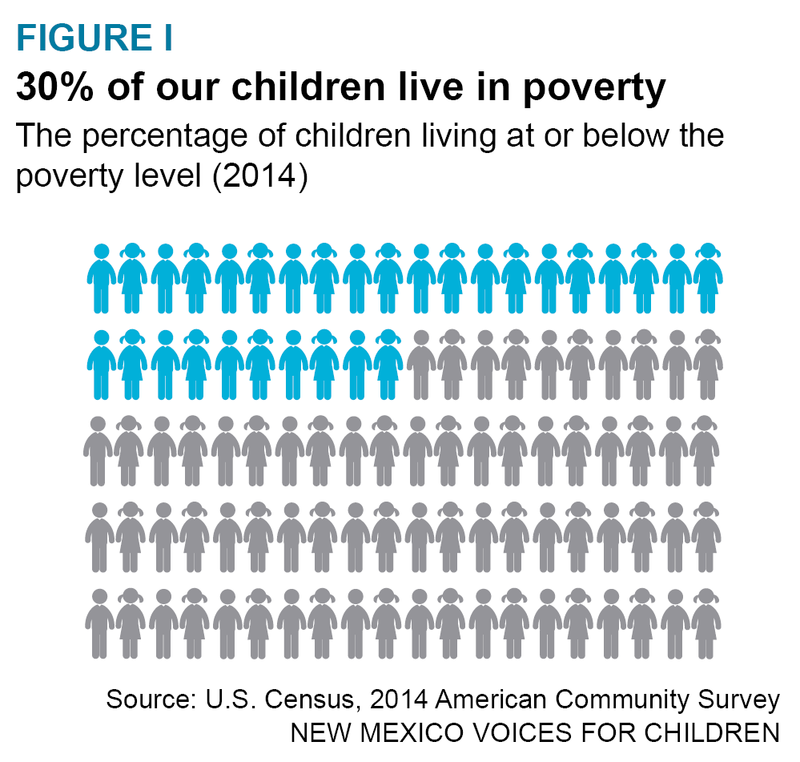 This leads to a very positive economic multiplier effect for communities across New Mexico while increasing the food security and health outcomes of vulnerable children and adults in the state.